The Suzuki DR-Z125 joins its larger wheel stable-mate, the DR-Z125L, with the small wheel providing a lower seat height for progressing riders wanting more power. Like the DR-Z125L, the high performance Suzuki DR-Z125 introduces a serious dose of fun into every rider’s first taste of the off-road trail. 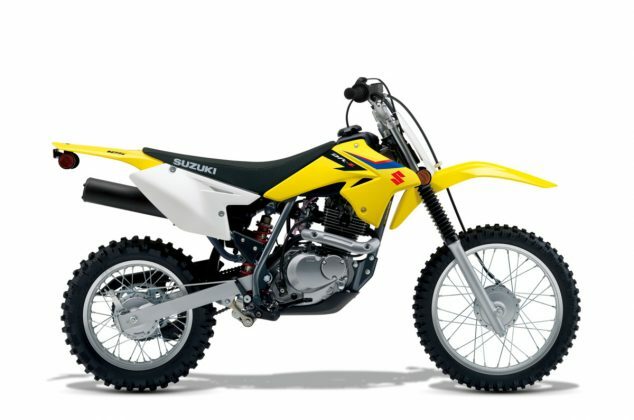 Advanced technology from top to bottom with a host of high-grade components inspired by Suzuki’s motocross machines. At its heart, a 4-stroke, 124cc power pack built to deliver tractable, accessible power, so riding’s as easy as possible. And smooth. The frame and swingarm have been created for ample rigidity and light weight, to produce a compact, perfectly proportioned off-road riding package. Easy on the eye as well. The fuel tank and frame covers are inspired from Suzuki’s state-of-the-art RM-Z motocross range.